When service members return, it's up to their families to try to soften their re-entry into civilian life. Healing Stress in Military Families offers practical help for military families coping with the myriad repercussions of their loved ones' duties, from their deployment to their return home. Based on the latest scientific research and best practice guidelines—as well as the authors' experience treating veterans and their families—Healing Stress in Military Families offers answers for the stress that comes not only from war, but also from other related issues, including deployment and redeployment, relocation, and reunion. Compassionately written with the military family at heart, Healing Stress in Military Families provides the information, tools, and skills that will empower these courageous families to more easily heal and become stronger and more resilient as they go through life. "This practical workbook will help others understand the highly complex factors that cause dysfunction within military families. Using a clear format that avoids jargon, providers and families can work through the eight practical steps that focus on reconnecting the family and improving resiliency. This excellent book will surely become core material for anyone interested in working with military families." 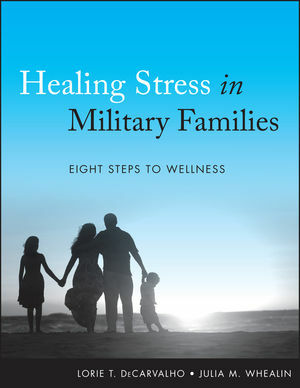 "Healing Stress in Military Families: Eight Steps to Wellness is a timely, practical publication that recognizes and addresses the impact of traumatic stress on countless 'hidden victims,' our military families. The focus on empowerment and goal-directedness—versus illness, disorder and dysfunction—is so needed today." DR. LORIE T. DeCARVALHO, PhD,is a licensed clinical psychologist and board-certifi ed expert in traumatic stress, pain management specialist, and peak performance coach. Dr. DeCarvalho is the former Founder and Medical Director of Behavioral Health Services for Adventist Health, Central California Network. She is the CEO of Center for Integrative Psychology & Wellness, Inc., a healthcare corporation that provides clinical care, consultation, education, and training for individuals and organizations at the national and international levels. She is an associate clinical professor of psychiatry at Loma Linda University Medical Center. Prior to this, she served as an Education Specialist at the National Center for PTSD. She is the co-author of Healing Stress in Military Families: Eight Steps to Wellness, Clinician's Guide to Treating Stress After War: Education and Coping Interventions for Veterans, and Strategies for Managing Stress After War: Veteran’s Workbook and Guide to Wellness, as well as numerous other professional, educational general interest, and self-help publications. Julia M. Whealin, PHD, is the Deputy Director for Education and a Research Health Scientist at the National Center for PTSD in the Veterans Affairs Pacific Island Health Care System. She is coauthor, with Lorie T. DeCarvalho and Edward M. Vega, of Clinician's Guide to Treating Stress After War: Education and Coping Interventions for Veterans and Strategies for Managing Stress After War: Veteran's Workbook and Guide to Wellness, both published by Wiley.